They call it NO PANTS SUBWAY RIDE for a reason. Because... NOBODY WEARS PANTS! It was 18 degrees in NYC on January 8, 2017, and I took off my pants to ride the New York City subway during No Pants Subway Ride 2017. Oh, I wasn’t having a hot flash, and no I wasn’t the only one baring their butts! There were people of all ages from all over the world, doing it too! 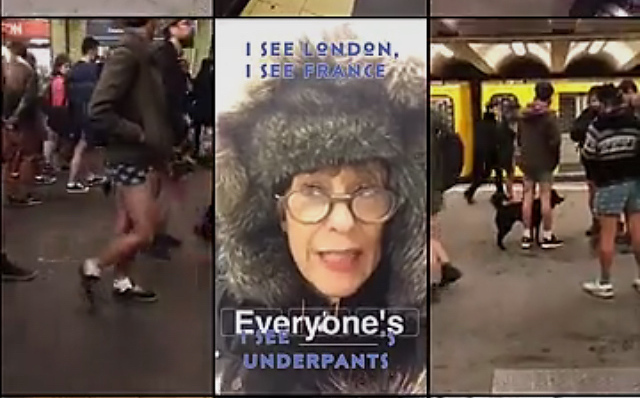 No Pants Subway Ride is a FUN- FOR- ALL-AGES event created by ImprovEverywhere‘s Charlie Todd. This year’s 16th annual leg baring, saw thousands of people “taking it all off” in 50 + cities, all over the world. With my new tech toy locked and loaded onto my iPhone, I was prepared to live stream broadcast the festivities to my global audience of over 11,500 viewers on Periscope. At precisely 3PM, I showed up at Foley Square (one of the 8 NYC meeting points) and took off my pants.And of course, I got SNAPPING! 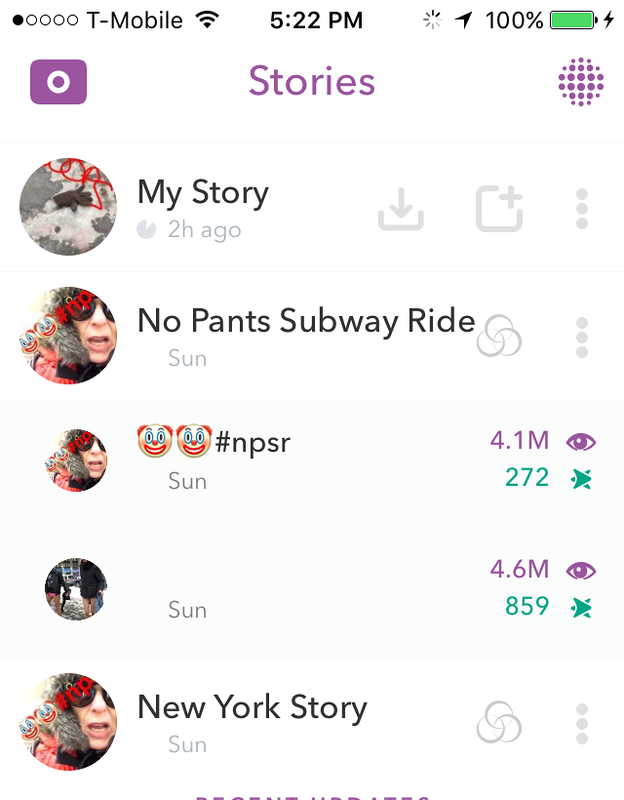 Little did I know, that when I posted several of my snaps in the GLOBAL “No Pants Subway Ride” they would be chosen for a curated feed in the Discovery section on Snapchat and viewed over 4.6 MILLION times. Needless to say, the event was a blast and a half. Check out this Youtube Video Snapchat Story to see me, sans my pants! Will you try to join us next year? Have you ever taken a ride on a subway without your pants? Next Daybreaker Dance For Mental Health- D.O.S.E. Exactly! Life is too short. That’s such a funny thing to call it – because ‘pants’ in England means underwear, so when I saw the title of this, I literally thought this meant people were walking around NYC subway wearing no under garments / underwear! It shocked me to want me to read more! What you term as ‘pants’ are ‘trousers’ in the UK…even so, I’d be a bit worried about hygiene, sitting on a Tube/Subway train with no trousers on! I have heard about the No Pants subway days and this is cool to see your coverage, or rather, un-coverage. Love it! I just love it Vicki! We have No Pants Subway here in Chicago too. I have to admit that I’ve never done it. 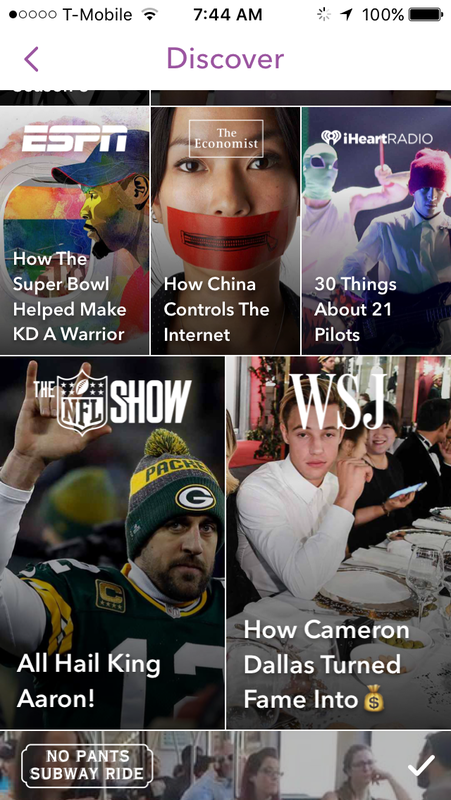 So cool that your video got picked up by the Snapchat Discovery section! Rock on sister! I saw an article about this on the news last night – it was the first I’d heard of it. Like Nathalie, I think it is nice to have some silliness from time to time. I don’t know if I would have participated myself though. I’d probably have gone out and bought some nice long bloomers first. With everything going on in the world it’s nice to have a little bit of silliness and forget the gloom and doom, even if just for the length of a subway ride.